Lip fold pyoderma treatment options are out there! This inflammatory skin disorder often develops between the folds of dogs’ lips, but can also form anywhere else with wrinkles, such as the face, groin or armpit area. Certain breeds are more prone to the development of lip fold pyoderma, also referred to as skin fold dermatitis, including: Spaniels, Pekingese, Pugs, Bulldogs, Shar Pei and any other breed with loose skin and wrinkles. But I thought you loved my squishy face and mouth? How Do I Know If My Dog Has Lip Fold Pyoderma? If you answer ‘yes’ to one or more of these things, your dog likely has skin fold pyoderma. Is Lip Fold Pyoderma Uncomfortable? When this condition impacts a dog’s lips it can be incredibly uncomfortable. Imagine when you have something wrong with your lip, it’s bothersome when you eat and drink and sometimes even when you’re doing nothing at all. It’s the same for your dog. We know how much you love your dog, and the last thing you want is for him or her to be uncomfortable. Luckily, there are ways to treat and prevent this nasty bacterial infection. What Is Lip Fold Pyoderma & Why Does It Develop? Pyoderma is caused by the formation of bacteria, which thrive in the tight, dark and moist spaces between dog wrinkles. Skin folds create a warm, humid environment. When your dog sweats or drinks water, moisture enters the picture, causing bacteria to flourish wildly and create an infection between wrinkles. In order to treat skin fold pyoderma you must keep the area as clean and dry as possible. Any excess hair should be clipped away. Many products used to treat bacterial infections are harsh, which creates a double-edged sword for sensitive pups. Skin Soother and Wrinkle Balm are the most gentle products out there proven to effectively treat, soothe, cure and even prevent skin fold pyoderma and other forms of dog dermatitis. These all-natural products are made from organic, vegan and carefully sourced ingredients that present no risk to your dog. For more serious cases, steroids are often recommended for treatment, but steroids are harsh and full of risks. Skin Soother and Wrinkle Balm offer a much less risky treatment option. Both products are strong enough to combat bacterial and yeast infections as well as fungus, all remaining completely safe for your dog, even if your pup eats it right off his or her face. Plus, it is scent-free, which dogs greatly appreciate. Skin Soother is the stronger of the two all-natural solutions, which is why we recommend trying it first to combat active cases of pyoderma. Wrinkle Balm treats less severe cases, and works as a great preventative measure after skin fold pyoderma heals. In rare cases dogs do not respond to traditional treatment measures, in which surgical removal of skin folds may be advised. Before taking to such drastic measures, we highly recommend trying Skin Soother. 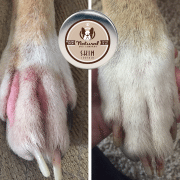 We have met so many dogs plagued by pyoderma and unable to find relief from anything until trying Skin Soother and/or Wrinkle Balm. Each product is less than $20 and comes with a money back guarantee, so you truly have nothing to lose. Will Lip Fold Pyoderma Come Back? A dog that gets any type of skin fold dermatitis once is prone to getting it again. That’s why preventative measures are so important after the condition heals. Make sure their food and water bowls are cleaned on a daily basis. Use a clean dry rag to rub away moisture from wrinkles 2-3 times per day. Apply Wrinkle Balm as often as every day; it’s 100% safe, natural and effective. Learn more about Skin Soother / Wrinkle Balm and read every ingredient we loving pack inside. Bundle up for big savings—buy Skin Soother & Wrinkle Balm in one affordable package deal. >> Want to see Skin Soother and Wrinkle Balm in action? Check out some of our BEFORE AND AFTER testimonials!